Choose File→Export→Create Handouts, then click the Create Handouts button. This brings up the dialog box shown here. Exporting a PowerPoint presentation to Word. Choose the formatting option you want to use. PowerPoint grinds and whirs for a bit, and then regurgitates the presentation in the form of a Word document, as shown here. 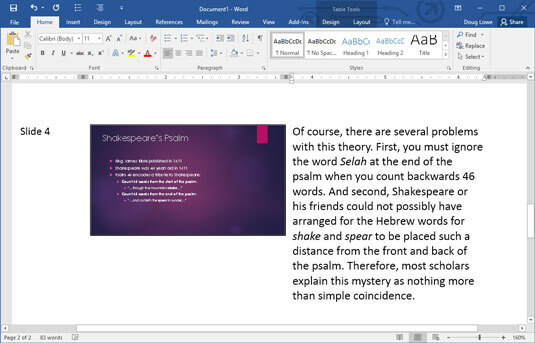 A PowerPoint presentation converted to Word. Edit the document as you see fit, then save it. Note that if you don’t plan on editing the document in Word, there’s no real advantage to exporting the presentation to a Word document. 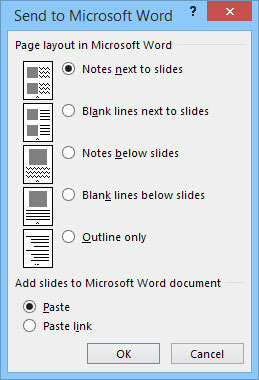 Instead, you can simply print the slides and notes by using PowerPoint’s Print command.